These custom made knock down screen door kits can be ordered online. You provide the manufacturer the correct door size by measuring the old one. The package will have the four rails and four pre-assembled corners. All you need is a rubber mallet and no other tools are required. The side rail comes with a pre-installed handle and latch. The bottom rail comes with pre-installed rollers. The knock down kit does not come with the screen. You will have to buy your own screen, spline and spline tool. The spline is what keeps the screen in place. The spline tool is needed to secure the spline. It is a petty straight forward job. Watch video. Screen doors on patio doors are able to let in a lot of fresh air and if you have a storm or screen door at the opposite end of the house, it also will provide cross ventilation. Screen doors are a good way of cutting down the time for air conditioners to run. There are however a few situations where the door may cause you some headaches. The screen door is supposed to keep out flying insects and it will do this as long as the screen is not damaged or cut. Keeping the screen in good condition is no problem as long as you don't have a cat , dog, kids or absent minded grown-ups trying to walk through a closed screen door. Another weak point with many patio screen doors are the locks and latches. They are often of inferior quality and it doesn't take much before they fail. And then there is a challenge of preventing the screen from getting damaged. A cheaply constructed screen door may have weak corner brackets which may result in the door getting out of square. If this happens the door no longer slides easy along the track and has the tendency to stick and jam. Every time this happens the corners will weaken further and sooner or later you will have to replace the entire patio screen door. Locks, latches and rollers last only for so long and will have to be replaced at some point. Finding replacement parts may not be easy and I would suggest the following. Remove the broken part and take to your local hardware store or home improvement center to find a match. 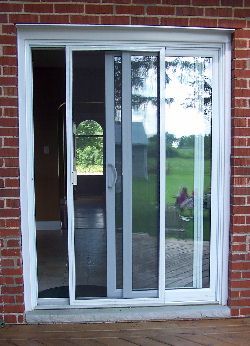 If you know the screen door manufacturer you may be able to locate the replacement parts online.